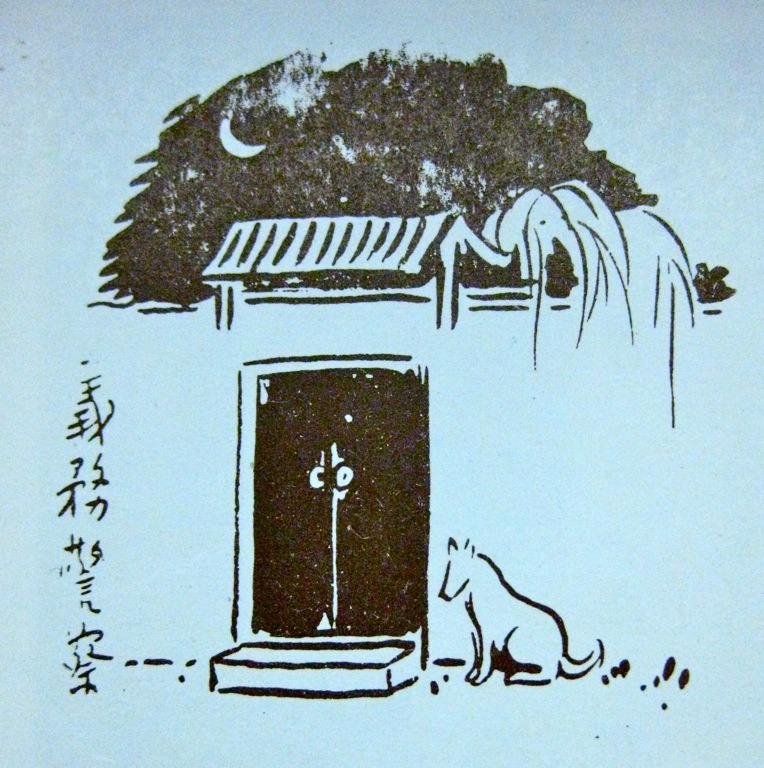 I want to point out the dual attitudes towards the dog as exhibited by these two pictures, illustrated by the same artist and appearing on the same page in The Young Companion illustrated magazine, the most popular general interest periodical of its kind in Shanghai (“Feng Zikai hua 豐子愷畫,” Liangyou 良友, no. 34 , p. 35). The top one is a solemn praise, taking the dog as a melancholy but noble figure, steadfast in his duty to an unseen master. The bottom one veers towards the scornful, even violent treatment of dogs — but this attitude comes from the picture, not from the illustrator. 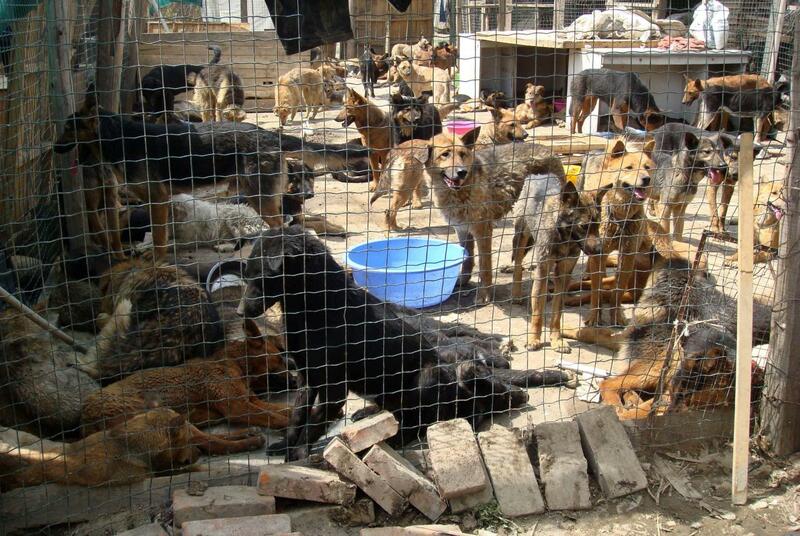 As far as I know, household dogs in China were not routinely branded. 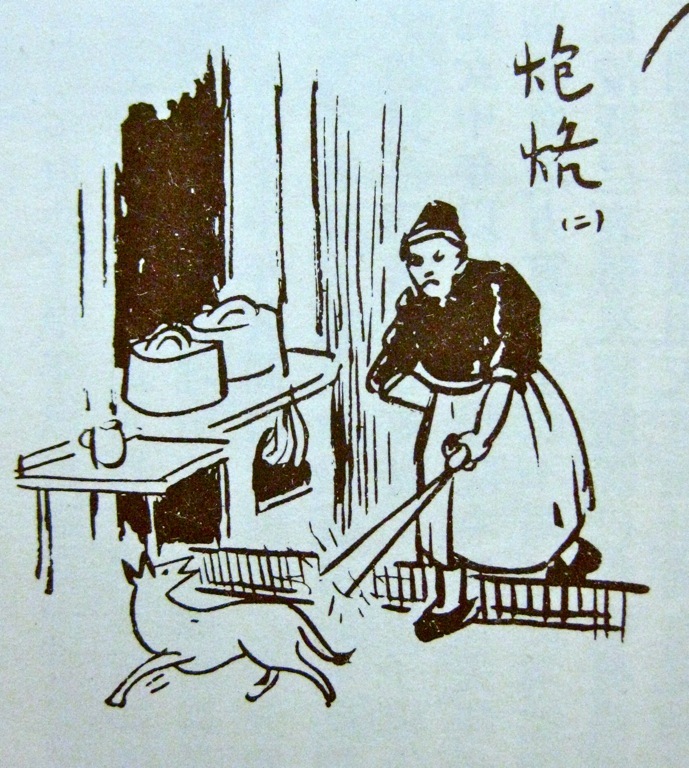 I honestly can’t be sure whether Feng Zikai is suggesting that the dog threatened with “torture by branding” is meant for the crockpots bubbling ominously in the background, or if the dog merely happened to be a wandering stray who was hoping for a handout, and fell upon the punishing end of a pair of flaming iron tongs instead. Given what I know of Feng Zikai as a Buddhist and a Pacifist, I am sure that he imagined both scenes with the sense of tenderness and pity that lurks behind so many of his simple sketches. Feng was an artist, an observer, but also an acute theorist who was deeply invested in the power of the visual. He believed he could gently prod his readership to accept the values of compassion that many of his pictures convey. Looking at these pictures a century later and a continent removed, I can’t help but want to bring that loyal dog out of the cold, or confiscate those tongs from that vicious-looking hag — and it’s likely that’s exactly how Chinese audiences were meant to respond back at the time, as well. I said this elsewhere, and I’m going to say it again. If there is any such thing as an “age-old tradition” of cruelty towards dogs in China, then there exists a concurrent measure of sympathy for that poor beast. Which is to say, it’s not much of a coherent “tradition” at all when you look closer and and realize that there are degrees of relative difference within any cultural category that is presumed stable and unchanging. Most “traditions” turn into rituals or practices in which some people participate while many others actively and conscientiously chose not to. The historical archives will show that this applies “way back” then, as it does now. One difference that I would embrace, enabled by new media technologies: there are more ways to document acts of heroic compassion when they occur. No matter where you are in the world, I applaud the impulse to do right by one of the few species who would behave as if it is his “duty” to do right by you.